Office 365 connects people anywhere. Your data and e-mail is available as well as cloud based applications meaning you can even work without your own device. 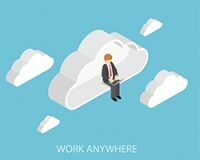 Flexible working is key in today’s business world and Office 365 offers this for office based workers, home workers and people travelling all over the world. You no longer have to worry about carrying your data or mountains of paper work as you have the peace of mind it is always available.